Naypyidaw (VNA) – Party General Secretary Nguyen Phu Trong received Chairman of Myanmar’s Union Solidarity and Development Party (USDP) Than Htay in Naypyidaw on August 25, as part of his State visit to the country. 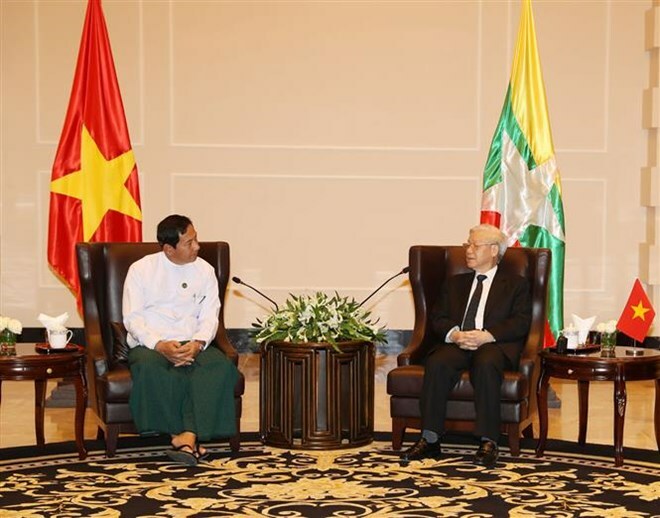 The Party chief told his guest about outcomes of his talks with President Htin Kyaw and the remarkable agreement between the two countries to establish a comprehensive cooperative partnership, describing it as a new milestone, a new height and new driving force for bilateral ties. Trong noted that Vietnam values the engagement with the USDP and the party’s significant contributions to Vietnam – Myanmar ties, which have helped lay a firm foundation for the newly-established comprehensive cooperative partnership. For his part, Than Htay said the USDP, as a major political party in Myanmar, always treasures and promotes friendship cooperation with the Vietnamese Government and Communist Party for mutual benefits of the two countries and their people. Both host and guest agreed to strengthen affiliations between their parties, thus consolidating the political foundation for Vietnam – Myanmar comprehensive cooperative partnership. On the occasion, Trong invited the USDP leader to visit Vietnam.